Yes. We all start the year off with great intentions of looking absolutely adorable every day for work. 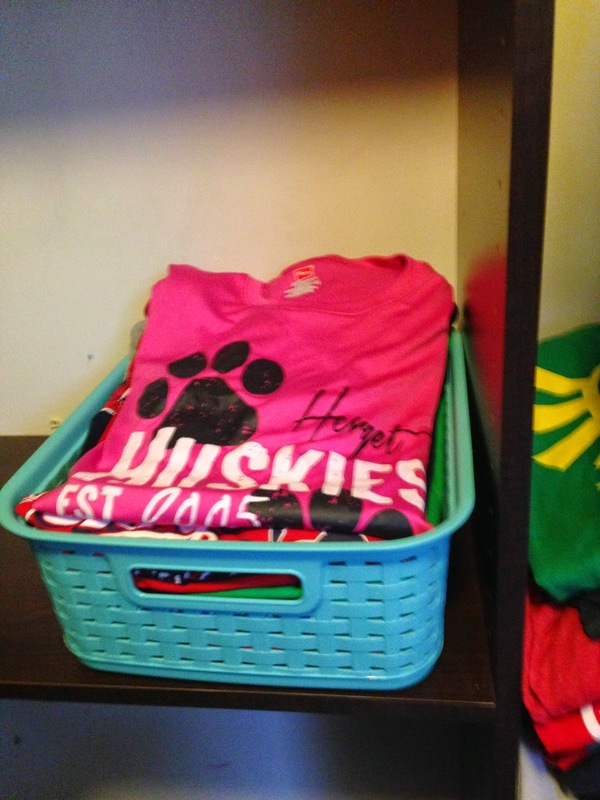 However- about three weeks in we start bringing home drafts of papers, tests to grade, there is end of unit planning to do, and we forget that ONE night to lay out an outfit for the next day. 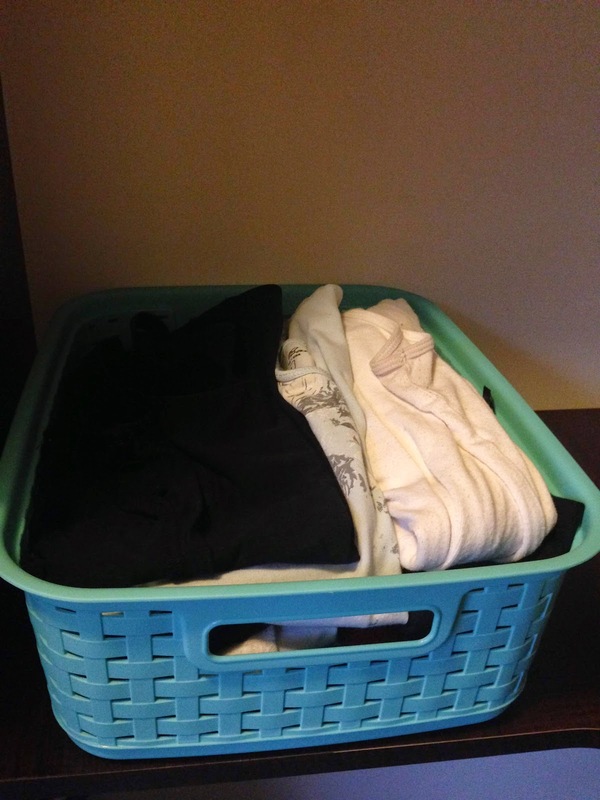 We pull something random out of the closet (who are we kidding, laundry basket with clean clothes that haven’t been put away since school started) in a haze the next morning, and then the process repeats, becoming a habit much more easily than planning an outfit every day was. At least, that’s what happens to me! 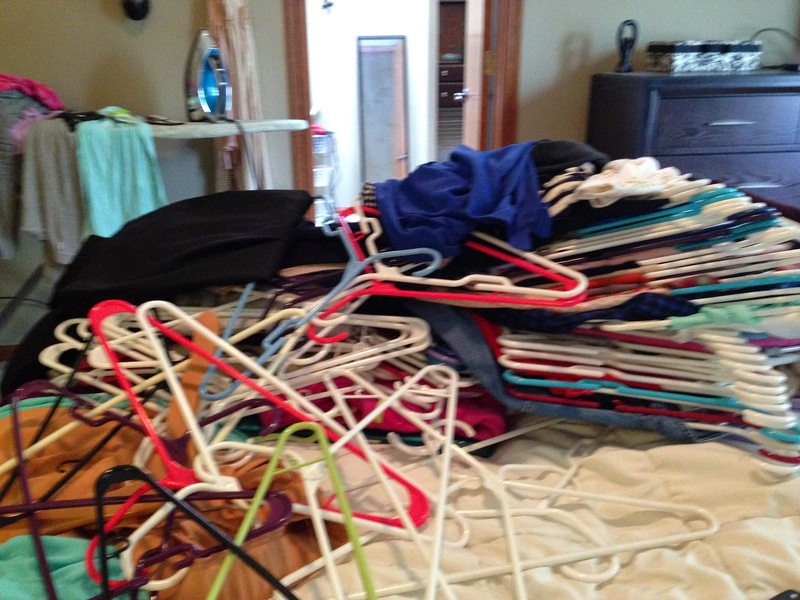 First- I started by pulling EVERYTHING out of my closet and assessing. 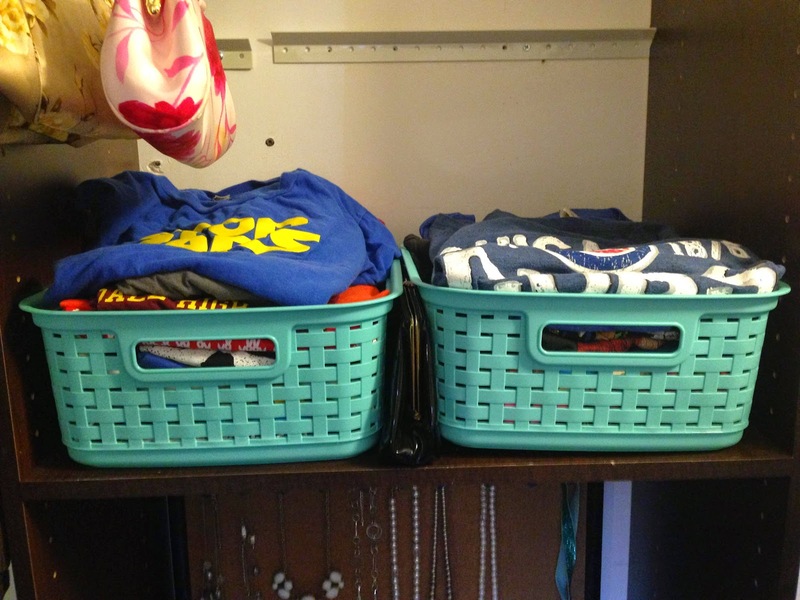 I sorted out all of my t-shirts and tanks, of which there are TOO many but I can't part with them, and put them into bins. All my favorite shirts from tv shows, geeky stuff, and Chicago sports gear. I got these bins at target, and I believe they are Sterilite. Good shoes- No surprise that shoes are my priority. I prefer my Tieks and Sperrys for school, because they are super comfortable! I try to avoid wearing tennis shoes to school, so my Tieks ballet flats are the perfect way to stay comfortable and dressy. Khakis- I love khakis. Especially the super soft comfy kind from Old Navy. These are so great to wear with my school polo or a sweater! Blazer- Dear Mom…you were right. Blazers are classy. Plain undershirts- By this I mean, plain t-shirts, cami’s, tanks, etc… I always need to have these in a variety of colors to throw underneath cardigans and button up shirts! Comfortable dress- You have to have a dress you can throw on and feel comfortable in all day. These are especially great to have for back to school night, conferences, a visit from the superintendent, etc… I’m not saying only have one dress, but make sure you have that “go to” dress that you feel confident and will help you let your personality shine! Nothing is worse than buying a new dress for a function and not feeling comfortable in it. A great pencil skirt- I think that pencil skirts in particular go with anything, from a draped blouse, to a button up shirt, to a cami and cardigan! Plus, pencil skirts tend to look good with flats or heels! Appropriate jeans- You know what I mean. They should not be the same jeans you would wear to garden, or ones that come pre-ripped/dirtied/torn. Since sometimes it is impossible to find ones without pre-rips that fit well, at least make sure they are strategically placed so that you can cover them with your top. Great sweatshirt- I have three sweatshirts: North Face, Harvard, Notre Dame. On Fridays I like to wear a hoodie with jeans, and what could be better than representing two fantastic universities? For fun, I love my hot pink North Face sweatshirt, because, hello, it’s hot pink! Obviously, I have way more in my closet, but these are the staples I think are absolutely necessary to put together any good work outfit. I used to have a necklace to go with every outfit, and in every color. They were all chunky ones from New York and Company, but I didn't really enjoy wearing them, I just thought it completed the outfit. Now I only have a few necklaces I will wear, including my Tiffany "J" necklace that the BFF and I both got as a gift, and my Tiffany Dove necklace from the hubster. I also have found that I am a creature of habit. I tend to want to wear the same jewelry over and over, so it's best for me not to have a lot to choose from or I just won't wear it at all. It looks like I have a lot of Tiffany, but I assure you I don't. 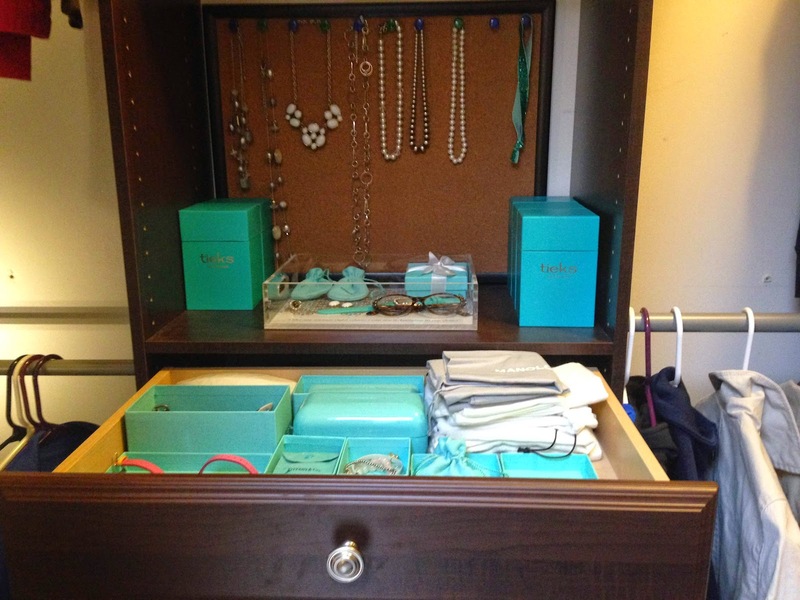 I use the tops and bottoms of the boxes as dividers in my jewelry drawer, because I am obsessed with the color. 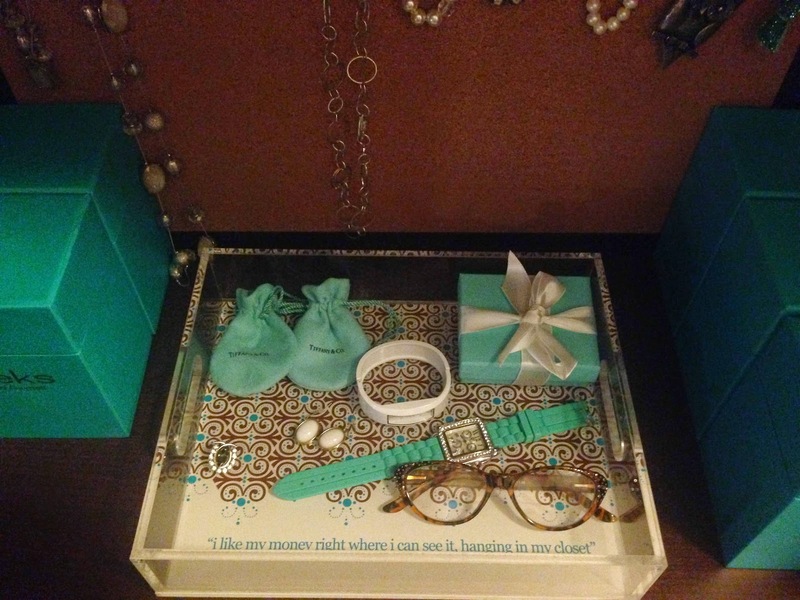 I also keep my Tieks on this shelf, along with my favorite pieces in my Erin Condren acrylic tray. 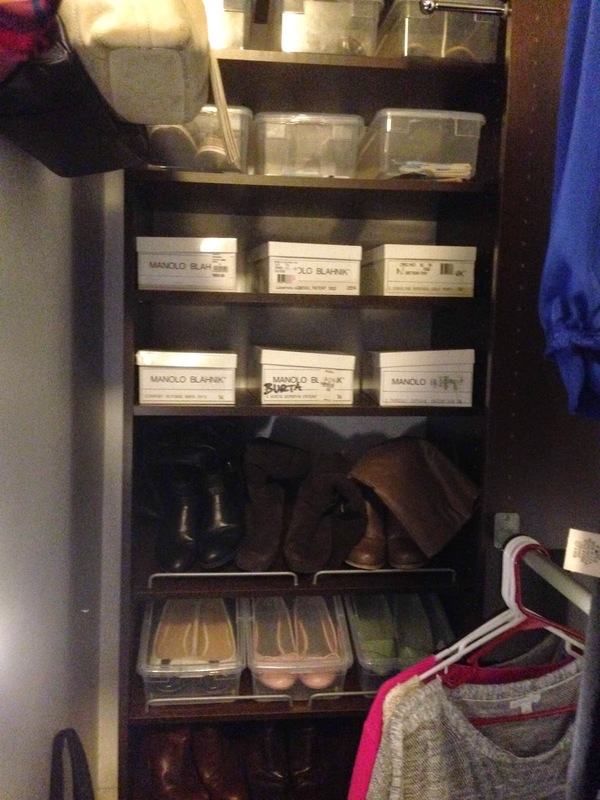 Well- I had to get rid of some shoes to make way for my new ones after our trip to NYC. 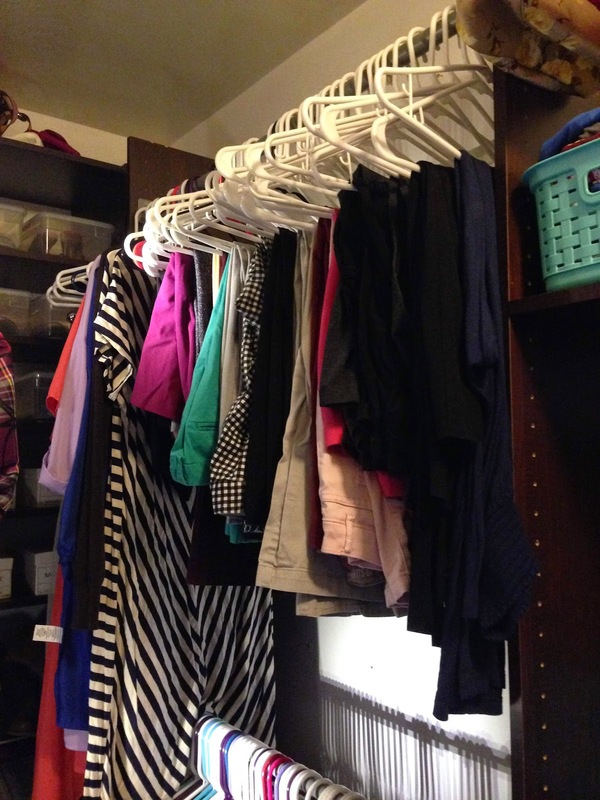 I took everything out of the closet that wouldn't be worn to work, so all my workout gear, t-shirts, sweatpants, jeans, everything, are in my dresser or in the bins. 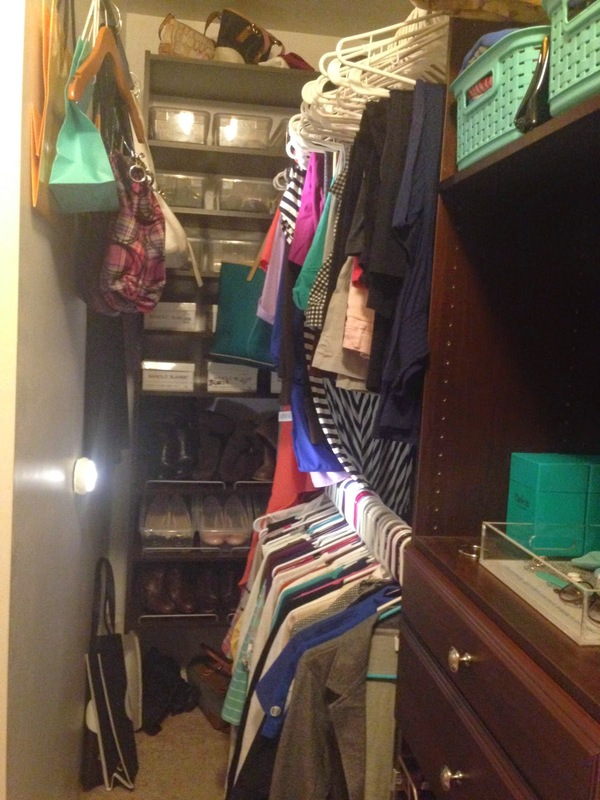 This way, when I go into the closet to get ready for work, I know that everything is an option! My other goal is to take pictures of every outfit. 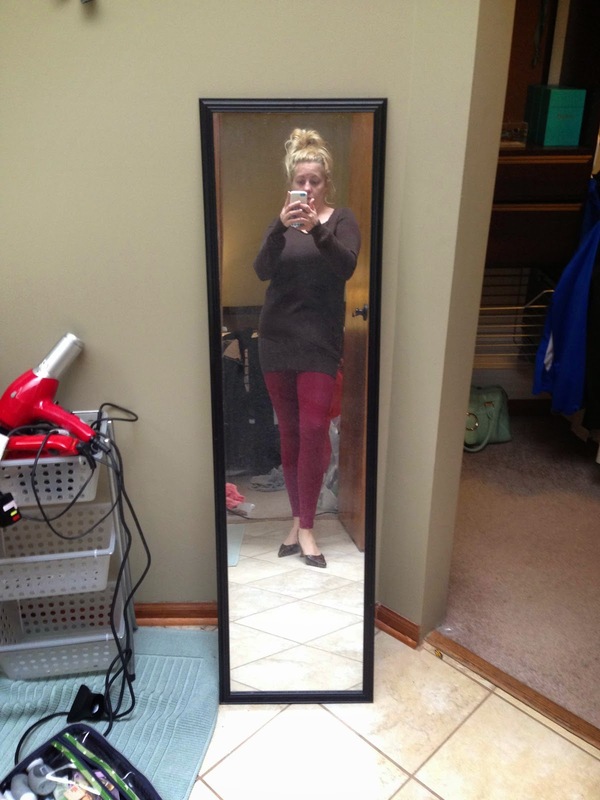 I use the Closet+ app, but it would be good to see how I look in an outfit that way I can know if it is worth wearing again, oh, and not to gain any weight at all, because my cranberry leggings finally fit and I want to be able to wear them in the fall with this sweater! 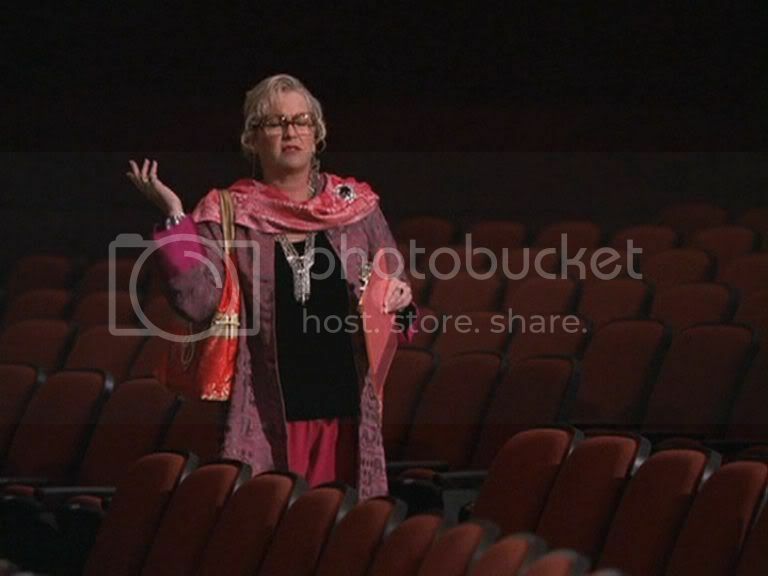 Unless you are Pink Lou Lou, holy moley have you seen her closet? Check it out at the link. She was the first blogger I ever followed, back when I blogged about fashion, B.T. (before teaching), and is still one of my favorites! 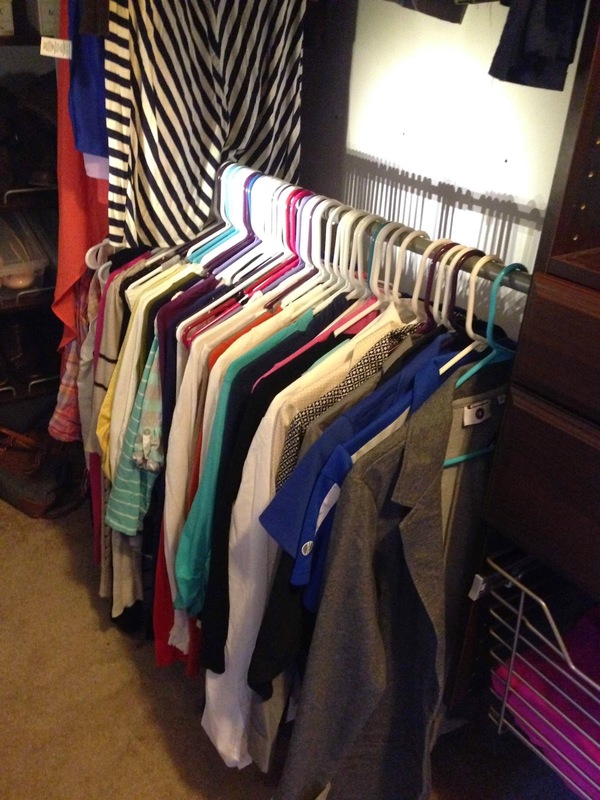 Now, to decide what to wear on the first day. I'll be hanging out in my closet if anyone is looking for me! Do you guys get to wear jeans to teach in? We can only wear them on Mondays [we have office hours and don't teach classes] and Fridays with a school shirt :/ We're trying to see if they'll let us do dark-wash jeans since they CAN look really nice with the right combo of clothes. We don't have a strict dress code, but it's recommended that jeans are only on Fridays. I feel like sometimes nice jeans can look better than other pants in this day and age! I think people still have this image that "jeans" day is for old and ratty jeans, which it is definitely not anymore! I would love to see it widely accepted to wear dark wash jeans, and I totally agree with you!